Image caption The Canterbury Archaeological Trust said it was "an enormous theft"
Hundreds of priceless artefacts dating back to Anglo-Saxon times have been stolen in a series of raids. Burglars smashed through a wall of a store room housing archives for the Canterbury Archaeological Trust. 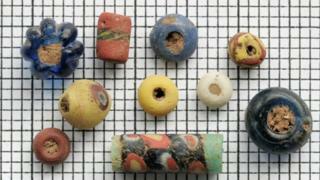 More than 850 Anglo-Saxon glass beads, large quantities of coins, metal and bone artefacts, and objects from its education collection were taken. Kent Police said it was investigating the thefts, which happened overnight between 22 and 24 January. The stores on the Kingsmead site hold thousands of artefacts dating back as far as the Paleolithic period. Some of the items taken were found during Canterbury's Big Dig between 2000 and 2003, documented by Channel 4's Time Team. The trust documents and researches the objects and also works with schools. The thieves also ransacked the trust's educational loans collection, disturbing 90% of the 200 loan boxes, and stealing replica metal axes, pins, coins and other items, including a plaster bust of Queen Victoria. Professor Paul Bennett, director of the Canterbury Archaeological Trust, said it was "an enormous theft" in which its archaeological archive had been "ransacked". "Their monetary value is passing but their value to the history of the city and to archaeology in general, and to the nation, is immense. "This is probably one of the largest thefts of archaeological objects anywhere in the country," he said. Prof Bennett added he would urge the thieves to return the items as they would get "very little financial gain".